About East Cork Crane Hire - East Cork Crane Hire Ltd.
East Cork Crane Hire was founded in 1987 by Tom and Cathrine Kelleher. Having a wealth of experience in the industry, Tom saw the need for a professional company to service the Cork and Munster area. 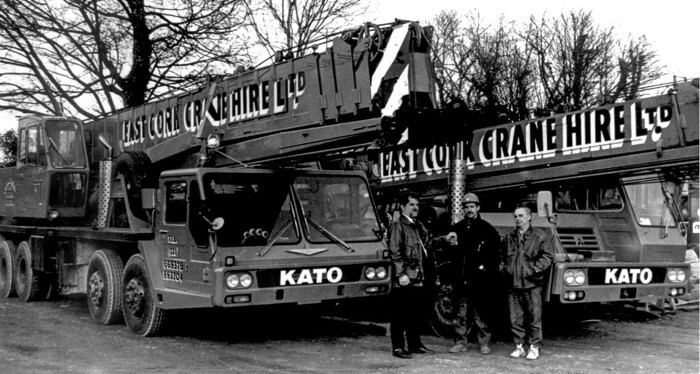 Since then the company has grown considerably and is now providing a leading crane hire service to all of Ireland. East Cork Crane Hire’s main priority is maintaining a strict and efficient safety standard. This, when combined with the best, most versatile equipment available, and friendly safety conscious operators, provides an excellent all round service. In 2003 East Cork Crane Hire diversified into the rental of concrete pumps as they expanded their range of services. This is a far safer and more efficient way of placing concrete, when compared to the traditional crane and skip method. The company invested heavily in this sector and now offers various options with a number of different pumps and all types of ancillary equipment to compliment this service. East Cork Crane Hire have a broad customer base, which varies from working daily with the major petro and chemical plants in Ireland, to one off lifts for private individuals. As a company that pride themselves in what they do, they are always on hand willing to offer advice on any project, from a one off single lift to a multinational company planning a major project. The company ethos of SAFETY, EFFICIENCY and PERSONAL SERVICE is reflected in their CIF SAFE-T-CERT accreditation. Based out off Cork they offer one of the largest selection of mobile cranes in Ireland. East Cork Crane Hire can supply cranes from 25 tonne to 500 tonne as well as a range of compact cranes for special projects. Click HERE to see the full fleet of mobile cranes available for hire.